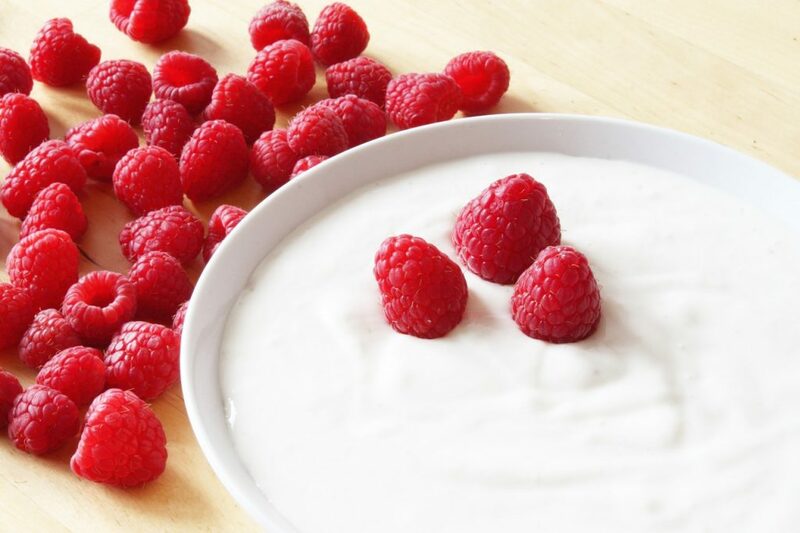 Greek yogurt, is great to replace in dishes and save tons of calories. Number 19 is a great recipe you can use today! 1 – Devilled eggs: Use Greek yogurt instead of mayonnaise for the same flavour without the guilt. You’ll get the extra protein, calcium and save on calories, fat, and saturated fat. 2 – Mix a cheesecake: Typical recipes can use a pound or more of cream cheese, but you can replace all or part of it with yogurt. 3 – Cream based sauces are loaded with fat. Get the creaminess you crave – and pack your pasta with protein – by getting rid of the cheese and cream and stirring in Greek yogurt instead. 4 – Marinate meat and seafood with seasoning and Greek yogurt instead of oil. You’ll cut fat, add tons of flavour, and keep your dish moist and tender. 5 – Add chopped cucumbers, dill and a pinch of salt for a quick Greek tsatziki. 6 – Top waffles and pancakes with a few dollops of yogurt instead of syrup. It adds protein in addition to cutting calories and sugar. 7 – For a quick dessert, stir in light jam, raspberries, raisins, cinnamon, nuts or shredded coconut. 8 – LIGHTEN UP SIDE DISHES: Whip up moist mashed potatoes by swapping in nonfat yogurt for butter in your favorite recipes. 9 – SIMPLE FROZEN YOGURT: Freeze a container of plain or vanilla Greek yogurt, stir in your favorite fresh fruit or peanut butter. 10 – TACOS AND CHILI: Opt for Greek yogurt instead sour cream. Use it to top tacos and chili for the same tangy taste and save 15 calories per tablespoon. 11 – Add horseradish to make a fish or shrimp dip. 12 – ADD PROTEIN TO SMOOTHIES: Triple the amount of protein in one smoothie by using Greek yogurt instead of milk. 13 – SLIM YOUR FAVORITE DRESSING: Replace the mayo the next time you make some ranch dressing. Not only will you cut hundreds of calories, but you’ll boost the protein and eliminate the fat if you swap in nonfat plain Greek yogurt. 14 – SOUP: Add creamy texture to soups by topping it with yogurt or adding in a few tablespoons after you remove from heat. OR Stir in to a pureed vegetable soup to add thickness and protein. 15 – SALADS: Substituting Greek yogurt for mayo in recipes for potato, tuna, and macaroni salads is an easy way to cut calories. Just mix it in with your favourite seasonings and spices. 16 – MAKE GUACAMOLE: Mix in a few spoons of calcium & protein-rich Greek yogurt. 17 – Mix with chocolate syrup for an easy fruit dip for a party platter. 18 – Add a pinch of salt for a rich substitute for sour cream. Put 2 cups yogurt in a fine-mesh strainer over a bowl, cover and let drain, refrigerated, for at least two hours and preferably overnight. This step is crucial; otherwise the yogurt won’t be thick enough to make proper frosting. Using an electric hand mixer, whip the yogurt with 2 teaspoons vanilla and a cup of powdered sugar on medium speed until the mixture is thick, about two minutes. Then cover and refrigerate for 30 minutes. Spread on cooled cake or pipe frosting onto cooled cupcakes from a quart-size Ziploc bag with one corner snipped off. Serve immediately. The recipe makes enough frosting for a dozen cupcakes.